In the historical literature and debates concerning the Spanish Civil War the question of “war or revolution” is always posed as a dilemma. This is odd. Because, for a long time now, people have been talking about “revolutionary war”, thus combining revolution and war, and since the Second World War one could even say that it has been very fashionable to talk this way, using such expressions as “war of national liberation”, “guerrilla war”, etc. In fact, in the Russian Revolution there was also an armed struggle that took place at the same time as the social revolution. It is only with respect to the Spanish Revolution that this dilemma is posed: war or revolution. In my opinion, however, Republican Spain, properly speaking, never posed this dilemma: war or revolution. The only people who posed the problem as war and revolution were the Spanish libertarian movement and the other revolutionary sectors in Spain at the time, but the attitude and conduct of the other major political and social currents were always directed towards using the war against the revolution. We can distinguish four major political-social currents in Spain during the Second Republic. •	Win the war to safeguard, and ensure the continuity of, the revolution: this is the position of the Spanish Libertarian Movement. •	Put an end to the revolution and restore the republican-capitalist State in order to bring the war to a good conclusion: this is the position of the republicans and the Catalonian and Basque nationalists. •	Use the war to crush the revolution and seize Power: this is the position of the Communist Party of Spain. First observation. There were major contradictions and discrepancies between the very diverse ends and means, but there was never an attempt to formulate a common platform, nor did anyone even think of establishing a terrain of minimum concordance. Far from it: because no one looked for such a compromise solution, no one even made any attempt to seek a certain degree of unstable equilibrium. All loyalties were focused and polarized around and towards the various organizations, but not even for a moment was anyone really loyal to the Republic. The most that was achieved was the creation of provisional coalitions between two or three political currents. The appeals—as frequent as they were inflammatory!—to antifascist unity were nothing but “grand camouflage” (to use Burnett Bolloten’s expression) to conceal maneuvers and schemes for dominance. Only the second government, that of Largo Caballero, actually represented the four political forces of our schema at the national level. In this sense, we could venture to say that the fall of Largo Caballero symbolized the fall of the Republic and its unity. Second observation. Even at the military level, the slogan of “unity makes us strong”, was never a reality. Rather the contrary. The famous “unitary command”, so clearly subordinated to the political interests of the Communist Party, only divided the armed forces and frustrated the war against Franco. The fundamental problem of the war, that of the organization of the armed forces, was basically transformed into a struggle for control over the army and its weapons. This is the truth that resulted from having militarized the militias and creating the “Popular Army” as an imitation of the Russian army, disciplined and regimented to the extreme. The militias were never guerrilla formations, but fought a traditional war of fixed positions and fronts. There was never a people’s army in the Republic, but the militias were in the process of developing toward the condition of a popular revolutionary army. Or, more explicitly: they exhibited a tendency to embody an armed force based on the voluntary self-discipline of conscious combatants who accept rational discipline, but without the old-style spirit of militarization that implied the total subordination of the lower ranks to their superiors. Despite the names, “Popular Army” and “Army of the People”, the Spanish republican army was, like the Russian “Red Army”, a copy of Prussian militarism and, of course, did not exhibit even the slightest hint of revolutionary inspiration. But the worst thing about it was that is was very ineffective. Third observation. The historiography of the Spanish Civil War has placed a great deal of emphasis on the confrontations between libertarian and Stalinist conceptions during the fratricidal struggle. But I think that, as this discussion became more emotionally charged, it granted far too little consideration to the socialists. It ignored the fact that the keys of republican politics were in socialist hands. Even before the war, the socialists were the largest party in the national legislature. And in the political spectrum, as it took shape during the war, the socialists were comfortably ensconced in the center, with the libertarians to their left and the republican parties and the communists to their right. The socialists possessed, along with the UGT and the Casas del Pueblo, the most widely-read press and a multitude of positions in the Government administration, and many departments of the State were under their influence; in short, they were deeply embedded in Spanish society. It is therefore not at all surprising that such a comfortable political position would be reflected by socialist predominance within the various Republican administrations. The fact is that, almost throughout the entire war, there was always a Socialist Prime Minister. And members of the PSOE were always appointed to serve as Ministers in the most important Cabinet posts (foreign affairs, war, finance, interior). Nevertheless, the Socialist Party never even once presented a socialist program or even a socialist policy worthy of the name. The PSOE proved to be incapable of uniting the war and the revolution, nor was it capable of formulating a platform of collaboration acceptable to the other political-social forces of the Republic. The truly socialist road was blocked by the above-mentioned divisions between the leaders themselves and their refusal to compromise, but also by that same shortcoming referred to above: the fact that they were incapable of uniting the war with the revolution in their own minds, and perhaps above all because they were unable to prevent the mass infiltration of communists and their fellow travelers and crypto-communists, who obtained membership cards of the PSOE or the UGT. The worst and most paradoxical aspect of this trend, however, was the fact that in all the major governmental crises of the Republic, we invariably note that the main opponents are found in the ranks of the same party: Prieto against Largo Caballero (1937); Negrín against Prieto (1938); Besteiro against Negrín (1939). We should therefore study this powerlessness in power. The historiography of the PSOE-UGT is still in its infancy, and what exists is of low quality. Nor are there any major biographies, and the reflex reaction of closing ranks and forming a defensive wall has prevented the development of an interesting literature by the former militants of the party that would reflect internal and external debates and reveal important facts. Fourth observation. Positions 2 and 3 have much in common if we consider them in relation to the question of war against the revolution. If there were any real alliances with the Republican ranks, they were the alliances of the Stalinists with the republican parties and the right-wing socialists. The culminating point of these alliances was the fall of Largo Caballero and the formation of the Negrín-Prieto Government, on the basis of a very consistent concept: no revolution, a strong and centralized State, militarization, and the promotion of an “ideology” of the Republic, apparently “progressive and democratic” but actually based on defending national independence against the aggression of international fascism. Even now we can still see traces of this alliance among the historians of the war (as Noam Chomsky has demonstrated in his unmatched study on “Liberal Scholarship and the Spanish Civil War”): “liberal” historians flatter the communists, and the historians who are sympathetic to the communists express views concerning the revolution that are indistinguishable from those of the bourgeoisie. Finally, there are also important differences that should be distinguished between positions 2 and 3, and between their respective consequences. Fifth observation. We note that the second position—bring the war to a good conclusion—is not the same as winning the war. Winning it is one way to bring it to a conclusion, of course, but not the only one, because there are two other possibilities: capitulation, or compromise or modus vivendi, negotiation, another “Convention of Vergara”.1 Attempts were made, naturally, to open up negotiations. For the middle classes, who were the social base of the republican and nationalist parties, reaching a compromise solution had the decisive advantage of liquidating the revolution. And for men like Azaña, Martínez Barrio and Prieto, a “Convention of Vergara” would have been the perfect solution to the problem of war and revolution. But the Achilles Heel of the policy of negotiation was, needless to say, the insuperable difficulty—not to say impossibility—of not having another party to negotiate with. And the other party, whether Mola, or especially Franco, rejected as a matter of principle any compromise at all and this attitude was only further consolidated and crystallized as the rebels continued to win one victory after another. These same victories precisely contributed to nourish the defeatism of the advocates of the second position, Prieto being its most well-known and eloquent proponent. Sixth observation. Concerning Position 3—that of the communists and the Kremlin—we have an abundant literature and in-depth studies at our disposal (the most comprehensively documented book on the war with respect to this aspect is the book by Burnett Bolloten), in addition to memoires, confessions and reflections by members of the party, and even more from its former members, and all kinds of publications on the Spanish revolution. These writings have only confirmed after the fact the observations, impressions and analyses of the most serious witnesses and writers that were written both during and after the war: Borkenau, Orwell, Brenan (and I will add two Dutch names: Lou Lichtveld—mostly under his literary nom de plume, Albert Helman—and Johan Brouwer). Both their strategic position under the circumstances as well as their Stalinist ideology forced the Spanish communists not only to fight against the proletarian revolution and the agrarian collectives, but even to deny—and here is the grand camouflage referred to above—the very existence of a Spanish revolution of 1936. (Even today, more than half a century after the revolution, this denial can still be found in the writings and publications of the Party about the Spanish Civil War.) 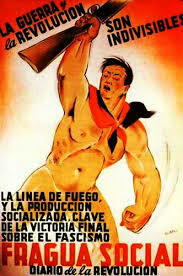 Thus, by denying and destroying the revolution—not without at the same time camouflaging its obstruction of the forces and fronts that the Party could not control—the policy of the Stalinists in Spain was very simple, coherent and therefore irresistibly persuasive: “fight the anti-fascist war as the situation warrants, and no nonsense”. This position had one great advantage: it was a self-fulfilling prophecy. That is: by destroying the revolution, the war would be increasingly transformed into a merely anti-fascist struggle. At the same time, moreover, the creation of a militarized army and the restoration of the centralized and bureaucratic State produced functionaries and officers who were easily converted into clients of the Party and advocates of its conservative policy. The weak point of the communist position was its interest in the war: the Party needed the war. And in order to take advantage of its position, the Kremlin and the Party needed to prolong the war. The end of the war, even a victorious end, would destroy this comfortable position. On the other hand, social layers such as the bourgeoisie and the middle classes—with their interests, their private property, capitalism, etc., so fanatically defended by the communist party—were increasingly more disposed to end the war and accept unconditional defeat. For the middle classes, the Franco regime signified, more than anything else, cultural repression, plus national repression in Catalonia and Euskadi, but not the liquidation or deterioration of their economic interests. Seventh observation. The libertarian movement was the only decisive and consistent force in favor of the revolution. This is so much the case that the very problem of war/revolution is more than anything else the problem of the CNT-FAI. The policy of the CNT-FAI provoked lively debates, first in its own ranks and afterwards in the international anarchist milieu, not to mention the historiographical literature. The goal of its policy—Position 1—was none other than the revolution; and the means to achieve this goal was the war. In times of war, however, means rapidly become ends-in-themselves. This was the tragedy of the revolution and of the CNT-FAI. The key word of libertarian policy and of the critique of this policy is: collaboration. Immediately after the victory in Barcelona against the military rebels, the decision was made in favor of a policy of collaboration by the Libertarian Movement. In all the historiographic texts one finds the inevitable encounter between the militant combatants of the CNT and the FAI (Durruti, García Oliver, Abad de Santillán, etc.) on the one side, and Companys and the other Catalonian politicians, on the other, on July 20, 1936, when the CNT made the decision to form the Committee of Anti-Fascist Militias of Catalonia, in conjunction with all the other anti-fascist forces. Everyone knows the defense offered in favor of collaboration, as well as the criticism directed against the Libertarian Movement for collaborating. It was that decision—according to its critics—that signaled the Libertarian Movement’s first step away from the revolution, the abandonment of revolutionary ideas and forgetting history and the revolutionary tradition of its movement. From this perspective, collaboration entails collaborating with the enemies of the revolution, withdrawing to a secondary level after the victory and paving the way for disaster and betrayal. In defense of the policy of collaboration, two arguments were adduced: first, the alternative to collaboration would be an anarchist dictatorship, whereas anarchism by definition rejects all dictatorship. The other argument refers to the weak position of the revolution outside of Catalonia and above all outside of Spain. Two very different arguments that nonetheless lead to the same conclusion: collaborate to win the war. The critics of the policy of collaboration only formulated alternatives in very general and vague terms: carry on with the revolution, no compromises, etc. Let us analyze these arguments. The argument of the collaborators based on the pretext of avoiding an anarchist dictatorship is surprising and hardly anarchist. It is true that the anarchists reject dictatorship, but they also reject collaboration—proposed by Companys in our case—with the politicians of the now-overthrown system. The anarchist and syndicalist theories offer an alternative to dictatorship and collaboration: participation in the reconstruction of society. And it was indeed the case that, effectively, this libertarian alternative was underway in the practice of the Spanish revolution. A self-managing revolution that followed its course outside, or at the margins of, the Committee of Anti-fascist Militias and the Generalitat, and separate from the committees of the parties and trade unions; a revolution, in short, that in fact displayed a participation that, while not total, was still quite considerable. On the political plane of the CNT-FAI, however, there was no possibility of formulating such an alternative. In fact, I can say that I have not even found vague intimations of the possibility of deciding in favor of such an alternative. At the plenums of July 1936 and, later, in the polemics concerning collaboration and, more concretely, in the Committee of Anti-fascist Militias, the problem was always posed as an either/or question, as an choice between yes and no: one either accepts or rejects collaboration. They were unable to formulate another alternative, with a third viable solution. We shall formulate it now. Faced with the offer made by Companys, who relinquished his position, and his own party, leaving the field open to the victors, in those extremely novel circumstances, the “model” response of the anarchists should have been as follows: “We are not the ones who are responsible for making decisions about our position in the anti-fascist struggle and its organization. We are only a handful of militants like anyone else, not leaders, we do not have any privilege of representation. That belongs to the people, who are now in the process of reconstructing society, creating the new institutions and structures with which the anti-fascist struggle will be coordinated. As anarchists, we defend the participation of everyone—and especially all the anti-fascists—in this reconstruction. You, Companys, and your collaborators and political allies, you are welcome, if you want to participate with us—but as just another militant, without special privileges or rights—in the task of revolutionary reconstruction. If an institution created by the revolution—whether a neighborhood committee or a confederal committee—entrusts you with a position of responsibility, we will accept the decision and collaborate with you”. In view of the real situation of the moment—a state of war, the immediate need to organize the struggle, etc.—one other libertarian response would have been possible: to accept the committee proposed by Companys as a provisional committee—so that it could confront the most urgent problems—on the condition that the committee would be replaced as soon as possible by a new confederal institution that would be created in the revolutionary and self-managed process itself, authorized in one way or another by the will of the people. The second argument of the advocates of collaboration—based on the assertion of the weak, difficult, and isolated or easily-isolatable position of the anarchist movement—was based on the international circumstances of 1936 and on the lack of revolutionary spirit on the part of the international working class. But “difficult and isolated” is not the same thing as “impossible”. The criticisms of collaboration emphasize other circumstances that are no less true: the extent of the revolution, its majority position in the Catalonian and Spanish proletariat, the revolutionary spirit that is capable of the greatest sacrifices, etc. Shortly after July 19, the declarations of the CNT-FAI begin to utilize an abstract, vague and amorphous terminology; one may read phrases like the following: “exceptional circumstances beyond our control”, “the needs of the moment”, “unforeseeable developments”, etc. These evasive and uncertain expressions can be explained only if we look on the other side of the coin: that of the anarchist and syndicalist ideas concerning the development of a revolution. •	The revolution is a process characterized by both progress and regression, the alternation of victories and defeats. There is never a definitive victory (like the seizure of power, according to Marxist theories). •	The enemy’s position—of the overthrown regime—is weakened and demoralized, and has been for some time. The established order has lost faith in itself and even its own legitimacy with respect to the people and even its own social clientele. The regime, attacked by the surging revolution, defends itself only by fighting a rearguard action, although not without still trying to save itself; making concessions and promising reforms. •	Violence plays a limited role in the revolution. And if there is violence, it is the spontaneous violence of the masses, like an unleashed force of nature, but not as an organized and disciplined armed struggle. In the anarchosyndicalist conceptions—already defended in 1907 by Monatte against Malatesta—revolutionary violence is only conceived in restricted terms: the economic struggle replaces the revolt, the strike replaces weapons and street fighting. The revolution must result from the victory of the general strike. •	The authoritarian tendency, the danger posed by the enemy within. The new masters, once installed in positions of command in which they have been placed by the force of the revolutionary process, crush the revolution and throttle the movements of the people. This model is very useful for analyzing different types of revolution, such as the French Revolution, the Revolution of 1848, most of the anti-colonialist revolutions and national liberation struggles…. But this same model, as traditional as it is, does not satisfy us in its application to the Spanish Revolution, with its vast libertarian popular movement. And this is the paradox and the tragedy of Spanish anarchism. Let us now compare the Spanish reality with the four fundamental points of the model summarized above. First of all, we must point out that, in effect, in this case we are dealing with a real revolutionary process. July 19, 1936—glorified in libertarian mythology—was the high point of that process that, having begun in February of that year, only accelerated after July. The beginning to which we refer is not the electoral victory of the Popular Front, but the incidents of direct action that followed that victory: the liberation of the prisoners in Asturias (without waiting for laws or Government decrees); the agrarian occupations movements; direct action in the factories (based on strikes) that involved movements and campaigns of social agitation on a vast scale. Then, at the same time, a politicization and a mobilization occurred, the likes of which had never been seen before in the Republic, and on a completely unprecedented scale, affecting the youth, above all; violence in the streets, and the Government in the process of losing its authority. In this process, July 19 figures as a glorious occasion, but also as the day of disasters; glory in Barcelona, Valencia and Madrid, but disaster in Zaragoza, Seville and Granada. Beginning on July 19, the revolution no longer confronted the old weakened republican regime, but had to fight exclusively against the Crusade, Franco’s counterrevolution, whose bloody aggression knew no truce, and gave no quarter, sure of itself and its legitimacy to crush the revolution. As for the second fundamental point, that is, the position of the enemy, the Spanish reality has nothing in common with the classic model. Therefore, the third fundamental point, that of violence, of the organized armed struggle against the enemy, becomes the dominant element of the revolution. Furthermore, July 19 signified the failure of the anarchosyndicalist conceptions. The economic struggle—the attempts to stage strikes in Zaragoza and Seville—was absolutely incapable of preventing the massacres. And, furthermore, the victory in Barcelona was not the victory of the economic struggle of anarchosyndicalism, but that of violent battles on the streets of the city. It is extremely clear that at the July Plenum, at which the policy of collaboration was approved, the debates did not conform to the theories in conformance with the anarchist revolutionary model. For those militants thrilled by the euphoria of the victorious day, collaboration meant something like: “We shall continue the struggle that we, the members of the CNT-FAI and the workers of Barcelona, assisted by other anti-fascist forces, have won here in the Catalonian capital, and we shall free all of Spain and carry out the revolution!”, without noticing that such collaboration would tend towards a development that is contrary—involution—to the revolution. But to get a clearer picture of why the CNT-FAI opted for collaboration, with respect to that phenomenon of “triumphant euphoria”, I would like to add a few more considerations, specifically on the mentality and thought process of the militants who were responsible for that decision. In the mind of the Spanish anarchist, the idea of participation could take an implicit, but not an explicit, form. In the writings on the reconstruction of society by the revolution, we hardly ever see the word “participation”. In these theoretical treatises, the focal point is above all “man the producer” in factories and trade unions, but much less attention is devoted by the authors to other aspects of society and sociability. With respect to this question, Carlos Semprún wrote: “… we can almost speak of the submission of the militants to their organizations and leaders”. Even among the movement’s self-styled “leaders”, this fidelity to their organizations (“the Organization”) is strikingly apparent. Reading their speeches during the war (those of the four members of the CNT-FAI who were Ministers, in their defense of their participation in the Largo Caballero Government) or the memoires written shortly after the war (Cipriano Mera, Juan García Oliver), at every step we encounter, on almost every page, statements like the following: “… because the Organization decided”, or “after the decision of the Plenum”, etc. The structures of the organizations are based on committees: Local Committees, County Committees … right up to the Peninsular Committee. The struggle itself and solidarity actions were organized by the corresponding committees: strike committees, prisoner aid committees…. And, finally, the revolutionary committees—with their proclamations that are sometimes of an inconceivable authoritarianism—attempting again and again to use force to cause the social revolution to break out in the Second Republic. All the major revolutions have experienced the problem of dual power. The most useful example is the power of the Soviets and that of the provisional government in the revolutions of February and October of 1917 in Russia. •	The old republican State (plus the Generalitat, in Catalonia) with all its administrative institutions and its executive apparatus. •	The self-managed revolution that was in the process of creating its own institutions of direct democracy: assemblies and committees in the factories, in the neighborhoods, and in the collectivized towns. And we should not overlook the attempts to create a confederal “superstructure”. •	And the third structure, halfway between the self-management movement and the State, which I call the committee-ocracy. The Committee of Anti-fascist Militias of Catalonia is the model that we think is most suitable to serve as an example of this committee-ocracy. This Committee did not represent either a parliamentary democracy or the mandate of the revolutionary rank and file. Its members did not represent either an electorate or much less the mandated revolutionary committees that had seized power. They were the representatives, the delegates, of the previously-existing organizations. These were anti-fascist organizations, of course, but also organizations that, in their majority, were part of the old structure of the movement. The members of this committee were answerable to their own organizations, but by no means, at no time, were they answerable to the people who had appointed them, voted for them or consented to their being named to their positions as delegates: moreover, they were not even answerable to the institutions of the self-management revolution (the committees of the agrarian and industrial collectives, etc.). Thus, the Committee of Militias was not based on any structural roots in the movement during the revolution, and the revolution had no way to defend itself from the Committee. Indeed, this Committee made it possible for the political parties—and along with them, the old political structure—to survive the revolution. And it is this same structure (except the Committee) that made it possible for the return of the political majority at the opportune moment to restore the old dormant, but not destroyed, structure of the Generalitat that would then liquidate the Committee of Militias itself. In fact, the Committee of Anti-fascist Militias was an authoritarian institution in the tradition of the “revolutionary governments” that had always been so detested and scorned by libertarians, which the latter also considered to be a contradiction in terms, all the more so insofar as it was a “revolutionary government” with an anti-revolutionary majority. I have already provided, when speaking of the Committee of Militias, a definition of the committee-ocracy. But now I will offer a more explicit description: the committee-ocracy is a political structure in which the institutions of Power are composed of representatives of the political, trade union and ideological organizations. The influence of the citizens is manifested indirectly and only through the mediation of the organizations that were looking out for their own interests. The committee-ocracy does not recognize the political rights—or at least not on an equal level—of unorganized men and women, which is why it calls upon them to acquire these rights by participating in an organization and, should they refuse to do so, they will remain outside of the committee-ocracy, regardless of the composition of the latter. In fact, the growth of the organizations was a very characteristic phenomenon of Republican Spain. Although it is possible that the committee-ocracy was already a part of Spanish political culture in 1936, in which the loyalty of the people (outside of the famous “little homeland” [“patria chica”]) was directed towards the organizations, bearers of ideas, rather than towards the nation. In any case, the concept of the committee-ocracy conforms to the Spanish revolutionary tradition, including that of the libertarian movement, despite the fact that there is hardly anything libertarian about the committee-ocracy. The very creation of the Committee of Anti-fascist Militias of Catalonia was not unprecedented, since it fits quite snugly into a tradition of revolutionary practice. We encounter this type of committee in the past (the revolutions of the 19th century; and, in 1934, in the insurrection in Asturias). Without waiting for directives or instructions from Barcelona, committees were formed throughout Republican Spain after July 19; the same types of committees, juntas, councils, etc., were created with the intention of representing all the active anti-fascist organizations. César M. Lorenzo has presented an analysis of all these institutions of a new kind, revealing their composition. There is a lack, however, of studies on these committees and on their development. After the disappearance of the Committee of Anti-fascist Militias and of other similar committees in other Spanish regions, the committee-ocracy would continue to exist, having been transplanted to the terrain of the structure of the old regime and to the “democracy of a new type” of Juan Negrín. Collaboration in the framework of the committee-ocracy was displayed at all levels, with representatives appointed (?) by the organizations. We also note the committee-ocracy in the CNT’s proposal to form a Council of War (an alternative to the CNT’s participation in the national Government), in the idea of a trade union government (May 1937), and in the Council of Aragon. It is still interesting to observe that the anarchist historiography of the war has paid a great deal of attention to the Council of Aragon and its dissolution, while it has almost totally ignored the Federation of the Collectives of Aragon. The Federation was a confederal institution formed from the bottom up by the collectives; while the Council of Aragon was created by the Organization (with a capital “O”) and its members were “cronies” of Organization insiders, as someone has pointed out (and they were not even appointed by the Regional Committee of Aragon, but by the Regional Committee of Catalonia!). Neither the central government of the Republic nor the government of Catalonia escaped the characteristics of the committee-ocracy. One of the most important such characteristics is explained by the inconceivable fact that, when the governments were formed, there was hardly any sign of any governmental program to follow, a joint policy. The Ministers were, above all, representatives of their parties or trade unions, putting their official positions at the service of their organizations in accordance to decisions made by those organizations, and always with the imperative of acting on their behalf; it was every man for himself, so that even among the Ministers of the same Cabinet there was hardly any exchange of information (!). The self-managed social revolution was the natural product of the libertarian movement, of the letter and spirit of direct action and of a long, carefully cultivated tradition of revolutionary culture. The revolution, once set in motion, was based on all the organizations that promoted it. The workers and peasants sought their own way forward independently of the committee-ocracy and of the organizations of every kind. The committees of the revolution, elected in assemblies, were very different from the committees that were formed within the system of the committee-ocracy. It is true that, at first, the organizations (as well as the institutions of the committee-ocracy dominated by the libertarian representatives) played a very useful role in the revolution, because they were very helpful in coordinating the different forces of the revolution. At the same time, however, their existence served to retard the development of the institutions of coordination that were directly connected with the self-management committees. This is why the self-management structure was soon frustrated, corrupted, and dominated by the other structures of Power: the committee-ocracy, the restored State. The revolution as an unleashed force of nature was turned into a revolution controlled by the State and, to top it all off, this involution was accepted and defended by the CNT-FAI. Hence the critique of the revolutionaries directed against the organizations, against the regional and national committees, against the militants who became leaders. The CNT and the FAI destroyed the self-management movement, or, if you want to criticize them in more moderate terms: they contributed to the destruction of the revolution. The thesis has even been advanced—by Michael Seidman—that the CNT-FAI transformed the revolution into a capitalist revolution of modernization. According to this thesis, the Catalonian bourgeoisie, due to its lack of initiative and ability, had failed to fulfill its mission of modernizing the productive forces. This necessary modernization was led by the CNT during the war in terms of the rationalization and centralization of industry, increasing productivity, and even intensifying discipline. In my opinion, the critique that is based on the almost complete separation between the Revolution and the CNT-FAI does not take account of the complex relations between the organizations and the revolution. The idea of a separation between the rank and file and the functionaries overlooks the fact that frustration in the movement was generalized, not only among the militants in the factories but even among the libertarian Ministers themselves. First, we have to discover whether the self-managed revolution and the committees of direct democracy, for their part, did not contribute to the creation of the above-mentioned committee-ocracy. Besides the war and politics, the revolution also had to confront its own problems and adapt to its own limits. “The avatars of anarchism” is the title of a Swiss thesis that reflects on the Catalonian revolution in the anarchist press of the time. The avatar that consists in the confrontation of utopia with the realities of society, above all of urban, modern society, gave rise to more than a few problems. Many libertarian revolutionaries chose to resolve them by supporting models that had as little to do with libertarianism as that of the committee-ocracy. The second question concerns precisely the development of relations between the committees, on the one hand, and the assemblies, the workers in the countryside and the inhabitants of the urban neighborhoods and towns, on the other. Concerning these two questions, there is information that should be sought in the general literature on the Spanish revolution and also in certain monographs on collectivized enterprises and towns. Up until now, however, as we know, a systematic study on the internal development of the committees and on their relations with the committee-ocracy has yet to be undertaken. For my part, based on the data at our disposal, I am of the opinion that the Spanish Revolution of 1936, with all of its defects, did not lose its libertarian spirit and displayed so much evidence of an impressive tenacity that we are justified in concluding that the Spanish Revolution was not devoured by the revolutionaries themselves, like so many other revolutions in history. The structure of the old State was restored in 1937. The Barcelona’s second Tragic Week, the fall of Largo Caballero, and the dissolution of the Council of Aragon, are merely the dramatic events that stand out as highlights of the process of recovery of the State. But the structure of the committee-ocracy did not disappear because of this development. To the contrary. We see that a symbiosis between the State apparatus and the committee-ocracy prevailed. This symbiosis took place precisely to facilitate the integration of the CNT into the political structure of the system. Outside the government, or within it (Segundo Blanco), this integration of the CNT was pursued and accelerated. The structure of the organization did not change formally. The plenums and meetings continued to be held regularly at all levels, but they no longer involved anything but the acknowledgement of faits accompli and inevitable decisions. The truth is that cenetista federalism no longer functioned: the position of secretary general of the organization became a position of power exercised over the organization itself, and not without its administrative bureaucratic apparatus having grown in the meantime. The growth of the administrative apparatus took place everywhere. The Civil War changed society: with the creation and the organization of the armies (more than half a million combatants), with the presence in the republican zone of more than half a million refugees, with the growth of the trade unions and parties, with several million new members, among countless other causes of the upheaval and transformation of social life in the Republic at war. But what I want to point out here is the fact that in Negrín’s republic, a social revolution that was diametrically opposed to that of 1936 was carried out: it was a revolution imposed by the State and it favored the new social layers that the state of war was itself in the process of creating, i.e. : the layers of the population that obtained jobs as functionaries and military officers; in short, a State bourgeoisie. This new bourgeoisie created by the war, and which took advantage of the situation of the war, had a statist mentality, a “no-nonsense” mentality, understanding “nonsense” to be the equivalent of the social revolution, liberal ideas and the rights of man. On the other hand, “sense”—and progress—in the statist ideology of doctor Negrín, meant modernization of society at all costs and at every level; and it advocated development led and controlled by a strong and dynamic State, capable of achieving the integration—and towards this end the committee-ocracy was an effective instrument—of all the social and political organizations into the system. The regime was clearly heading in the direction of fascism, as not a few intelligent observers who were eyewitnesses in situ pointed out; Orwell, for example. This author, like other observers, offered us a reflection of the greatest importance regarding this development. For Orwell claimed that the tendency towards Stalinist fascism was only a tendency; that, in the final analysis, Republican Spain would not become a totalitarian State, nor would the Republic undergo a process that would lead it to become the first of the “people’s democracies”. And why not? It is possible that it was the committee-ocracy itself that would have prevented it from doing so. On the one hand, the committee-ocracy helped create the Negrín regime by fortifying its authoritarian mechanisms; on the other hand, this same committee-ocracy functioned as a counterweight, thus preventing the Republic from sliding towards a closed, total dictatorship. It is therefore quite possible that, thanks to the committee-ocracy, the Spanish State under Negrín would not have been able to attain the absolute monopoly of Power that every dictatorship represents. The organizations—trade unions or parties—were still centers of a limited but real, relatively autonomous, power. And the definitive proof of the positive role of the committee-ocracy during that period is the fact that, at the end of the war, when the cause of the Republic was doomed, it was the committee-ocracy that rose up in rebellion against the attempt to impose a Negrinista Stalinist dictatorship. Casado’s National Council of Defense is almost the “model” institution of the committee-ocracy. In the program of Casado’s Junta—the last expression of the committee-ocracy—there is no mention of either the revolution or the war. The only goal was to save the defeated. Translated in November 2018 from the Spanish translation of Francisco Carrasquer. Spanish translation published in Polémica, Nos. 31 and 32, March and May, 1988. 1. The 1839 peace agreement between constitutionalists and “Carlists” (monarchists) that ended the First Carlist War in Spain [American translator’s note].